Although I had good blogging intentions, once the showing starts it gets tough. Since I'm in the passenger seat on my way home and Scott's at the wheel., I thought I'd write my wrap up on my classes for the week. western AOT country pleasure class. Diva showed on tues and weds nights and was in the ribbons - 5th and 6th in larger classes in the country pleasure division. Doing better western than english. We sparkled more in the western bling i guess. On Thursday Scott arrived and B had his first class of the week. His 1st class was english and the competition was deep with grand champions and world grand champions- yikes! That is always intimidating when you see them warming up before the class and know they will be in your class. Such great horses. He pulled out a 6th placement behind WGCs like Firecracker, Suiza and Leo Decaprio. So all said, not too shabby in a large class that counted in the 'teens. We got a piece of it. 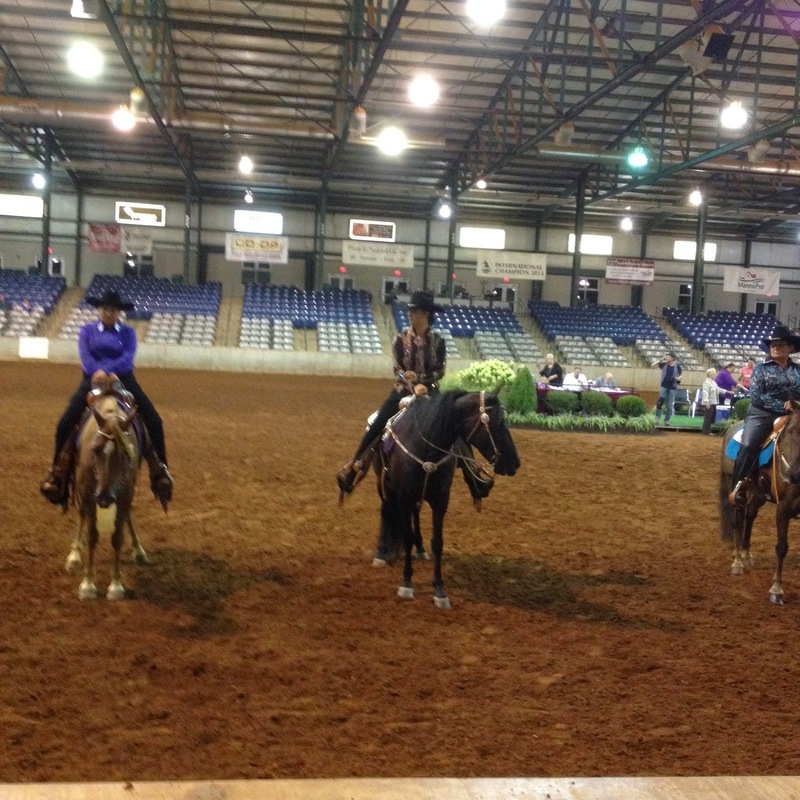 On Friday both Diva and B showed in western. In the same hot competitive field B got 5th...and one judge even placed him 2nd ahead of a few WGC, which was exciting! There are three judges, so it's always interesting to see what each placement is, as well the final standings. They post the judges cards in the show office, so you can go see them each day. Next on board was Diva, in western. I slipped into my blingiest bling bling western shirt to ensure we wouldn't be overlooked and rode her on in. She did an awesome job, and she gave her all in this class. She felt good and I was all smiles as I pulled into the lineup. She got 8th in the class, which was a little disappointing for how great she felt, but in the ribbons nonetheless. And again among some super outstanding horses. I couldn't be prouder of her, my shaking machine. Love this mare. B hit the rail for the trail AOT class and this time pulled a 3rd. This was probably his best ride of the week as far as performance. Although our grand entrance was a trip as we entered the ring. I guess we got that out of the way right away. Doh! But then we picked it up and were in sync for the rest of the ride. Since B is 5, western is one-handed, and that's new for us this year. So I'm happy we made it both ways of the ring and stayed on the rail without mistakes. The third placement felt good, we were climbing the ribbons. He was such a good boy as usual and we are really starting to click. On Saturday we decided to enter one championship class.We would show back with B to give him one more go at it. Scott picked his favorite shirt for me to wear and we decided we'd definitely do the western class. I pulled out the Dale Chavez tack and moved his bit onto the matching headstall. Our class was about halfway through the noon set. We readied everything and went through DQP and into the warmup rIng to tack him up. I then worked him in the warmup for a few classes prior to his. Then our class was called and we all lined up to enter the ring. It was a smaller class, many riders that don't fair well typically don't show back. It was only 4 horses who came back. The Red & Blue ribbon winners in the 'circle! Bourbon, me, Wayne and Firecracker. Westbrook jumped in the winners circle with me, and both of us got our photos taken together with our horses. I know Wayne from when we were over at Hannah's with theses horses. So it was nice to see Hannah's horses move to AOT division and continue to perform well with their owners. So that wraps up the show report on our classes for 2014. Another great year. And our horses were always in the ribbons and made every judges card, even in the largest classes. Plus we got to take a reserve championship lap. Woot woot.